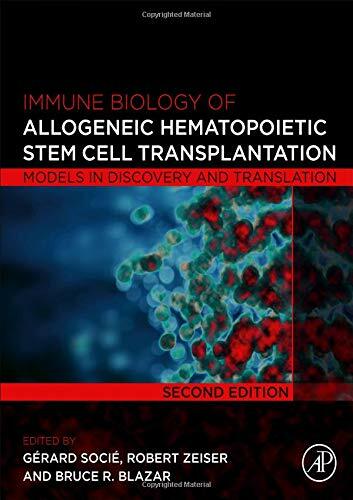 Immune Biology of Allogeneic Hematopoietic Stem Cell Transplantation: Models in Discovery and Translation, Second Edition once again provides clinical and scientific researchers with a deep understanding of the current research in this field and the implications for translational practice. By providing an overview of the immune biology of HSCT, an explanation of immune rejection, and detail on antigens and their role in HSCT success, this book embraces biologists and clinicians who need a broad view of the deeply complex processes involved. It then moves on to discuss the immunobiology mechanisms that influence graft-versus-host disease (GVHD), graft-versus-leukemia effect, and transplantation success. Using illustrative figures, highlighting key issues, describing recent successes, and discussing unanswered questions, this book sums up the current state of HSCT to enhance the prospects for the future. The second edition is fully revised and includes new chapters on microbiome, metabolism, kinase targets, micro-RNA and mRNA regulatory mechanisms, signaling pathways in GVHD, innate lymphoid system development, recovery and function in GVHD, genetically engineered T-cell therapies, immune system engagers for GVHD and graft-versus-tumor, and hematopoietic cell transplant for tolerance induction in solid organ grafts. This entry was posted in stem cell book and tagged Allogeneic, Biology, cell, Discovery, Hematopoietic, Immune, Models, stem, Translation, Transplantation. Bookmark the permalink.